Over the last few years Fire Mountain neighbor Jay has kept up this Fire Mountain Garden Exchange blog and thanks to him, we have lots of great archives about what grows well in Fire Mountain and when. But recently Jay has been busy training his Black Lab companion dogs and we felt like our gardens are part of our lifestyle here in Fire Mountain so we will simply post tidbits of information to the FriendsofFiremountainsite.com site. The recommendations from Charles Ledgerwood’s “Reliable Seeds 1994” can still be found here in the archives and are still highly recommended! We have all followed many of those recommendations and they always seem to turn out the best – even more so than any instructions on our seed packs. For all the great info from Mr. Ledgerwood visit the sidebar and click on the month you’re planting – every month has the recommendations and archives, you just have to dig a little bit…but you’re probably used to that. *If you would like to take over this blog or have a burning desire to see it revived, please feel free to comment below or email friendsoffiremountain@gmail.com. What a simply gorgeous start to October, might have been the nicest day of the year, we are in the transition zone, the end of struggling tomatoes (some are always better than none) and the need to clean up the summer garden and prepare your beds for fall/winter and spring. I was away a good part of September, coming homing to diminishing returns from the eggplants, tomatoes and watching the green beans whither. I must have pulled 40 or more pounds of beans from these plants, I have already overloaded you with the canning stories, but there is one more step. We have a huge amount of beans that eluded picking and are now drying on the vine. I collect and shuck them when the husks are dry and crackle. They provide a couple of pounds of dry white beans (my plants were Kentucky Wonder) As a cost saving, probably not worth it, but as a finish to a wonderful crop and a great instruction event for kids, shelling beans in a family and friends group is a great occasion. It’s nice to make a soup or pasta and bean concoction to finish out the year. Of course we toss the vines into the compost. We have already posted the planting recos separately, but let me recommend as always, peas, beets and lettuce, they grow like gangbusters here and you can be in salad heaven all winter (plus you get to send pictures of fresh veggies to family and friends back east while they are buried in snow!!!). This year I changed one of the raised beds to overhead watering. I have tried drip, laser tubing, soakers and hand watering.Each has its place and each type of planting works better with a different type of watering system. I would love to use soaker hoses on my entire garden, but tomatoes and cukes, beans and eggplant need more water. I don’t have enough sprinkler stations and valves to split my garden up so I have always had to compromise. This year I tested one of my 8’ x 8’ raised beds with a new system. I have timed water to the entire garden. In this one I put 18” risers with ¼ spray heads at each corner, I can dial down the flow with a manual gate valve at each bed so there is very little overspray. I have a killer beet crop and have had lettuce all summer. I keep 50% shade cloth in frames over the lettuce and let the beets free range. I am very happy with the results and will be expanding the method into the next roto of beets and lettuce. This would work well with spinach, kale etc. 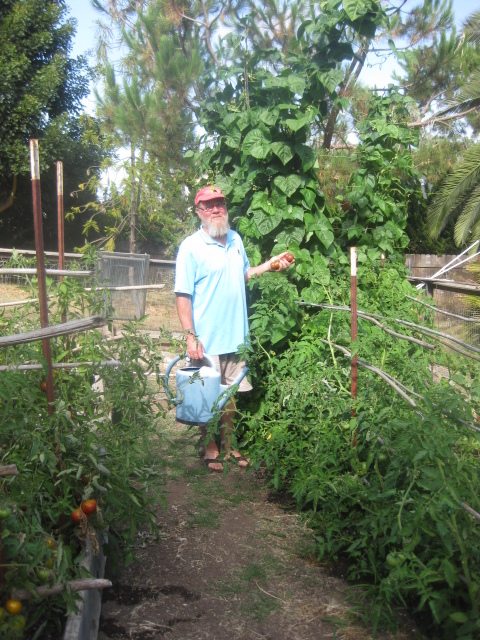 After the result that I had with my beans and tomatoes, next week I am heading back out to Escondido to the mushroom farm to pick up a couple of loads of horse/compost mix. I am going to dig in a bit and let the rest age and leach in what I hope is another wet winter. Let’s hope for rain, cleans up the garden and start planting. As is our custom, we shall use the 1994 Edition of Charles Ledgerwood’s “Reliable Seeds” as our guide to planting. BEETS, BROCCOLI, BRUSSEL SPROUTS, CABBAGE CARROTS, CELERY, CAULIFLOUR, ENDIVE, KALE, KOHL RABI, LEEK, LETTUCE, onions, MUSTARD, PARSELY, PARSNIP, PEAS, RADISH, RUTABAGA, SPINACH, SWISS CHARD, TURNIP, COLLARDS, FAVAS, WINTER ZUCCHINI. Lupin, Nemesia, Nemophila, Pansy, Phlox, Petunia, Poppies, Primula, Scabiosa, Schizanthus, Stock, Sweet peas, Verbena, Viola, Snap Dragon, Wall flower, wild flowers. So here we are again in the terminal days of the summer garden and the start of probably our best growing season. Right now I am at the end of my first tomato crop, a few Green Zebras and Blacks from Tula for salads. One of my green bean towers (Kentucky Wonder) fell over while we were in the mountains last week (makes it much easier to pick!) but I have to say that this has been the best year for beans in my memory. I put it all down to the mushroom/horse manure compost (see last several rants). I have put up over 20 quarts of dilled beans and another 10 of cukes. As long as you pick regularly you will have unlimited supply. Since I missed a week + I have a lot of beans that have passed the eating stage. These are perfect to let mature and dry, then harvest and shuck. Last winter we were making soup out of the white beans from the Kentucky Wonders. There is something magnetic about sitting with friends with an adult beverage shucking beans and shooting the bull. Must have gone on for tens of thousands of years and I think it is a genetic memory, plus a load of fun for young and old. So I have two more of my sequential tomato crops coming in, each five plants only the next producing crop is of Black from Tula and German Green and they are producing. I have five more that I planted a month ago, just what ever good looking heirlooms I could get from Green Thumb. I have never heard of “Manitoba” as a tomato, although it is the birth place of my Mother. The last five are thriving, 3 set all have abundant leaves which sometimes masks non production. Don’t forget to pull plants from their containers to see how root bound they are before you buy, a totally root bound plant is going to take a long time to recover and we don’t have much summer left. Beets are bootin’ as is the first preliminary lettuce crop. I still have a ton of egg plants of multiple varieties. I bought a couple of basil plant from TJ’s two months ago. I planted one in a 5 gal container and keep it near the kitchen. The other I planted in the garden. Oddly the garden one is dying and the pot is cookin. With plants like you get from Trader Joe’s they could have been stimulated too much for one of them to make it but 50% is pretty good in gardening. My herbs are doing well, chives (had for dinner on boiled potatoes w/butter), French Tarragon and two types of struggling parsley. So this is now the time to think about October planting, go back and look at my comments on the compost. I am planning on getting two pick ups full and piling them near the garden , let the rain leach them this winter and then slowly dig into the garden all year long as I move from planting bed to bed. Look back on the September and October rants from last year. I wish we had a place where we could dump ten big 10 wheelers of this stuff to cure and then have the locals come and buy some on the cheap, but that’s another story. For those of you with a canning history, I urge you to share it with your friends and family. The methods and the stories and the equipment need to be passed along. I have had an exceptionally abundant crop of cukes, beans and beets this year, I used up al the canning jars I had. I acquired many of my jars from my dear friend Esther Bandy, who had a remarkable collection. When I filled those, I asked her if she knew where could I get some more. She turned to a friend from Valley Center who no longer cans but had a great stash of jars, lids and rings. I will of course reward them with fruits of my harvest, but I think the bigger point is to share the growing, harvesting and preserving tradition with your children and your friends. If you have family that canned and they have stocks of jars and lids, get them, if you don’t want to use them, give them to someone who does. My last bean canning, I am sure that the jars were 50 years old plus, the lids easily from the ‘40’s and the rings the same. If you have family that used to can, pick their brains, if not get on the net and start, it is cheap and rewarding, it is however hard hot work so understand that eating the best green beans you ever ate in January is not without a cost. Prune, compost and prepare for your October garden! As ever, I am using Charles Ledgerwood’s 1994 “Reliable Seeds” pamphlet for my reference. Best bets are in all caps. Bush beans, Beets, Broccoli, Brussels Sprouts, CARROTS, Corn, CELERY, Cauliflower, Endive, Kale, Kohl rabi, LEEK, Peas, Mustard, Lettuce, Bunching onions, Parsley, Parsnip, Radish, Turnips, Swiss Chard and WINTER ZUCCHINI. I really suggest beets for the local garden; they grow so well here, the greens are absolutely delicious in salads or steamed like spinach. They are great in quiches. The best part is canning the beets for winter consumption; it’s very easy and very rewarding. Calendula, Centaurea, Cineraria, Cosmos, Delphinium, Dimorphotheca, Foxglove, Gypsophila, Hollyhock, Larkspur, Linum, Lunaria, Nasturtium, Nemesia, Pansy, Phlox, Petunia, Poppies, Primula, Salpiglossis, Snapdragon, Stock, Sweet Peas, , Viola, Verbena and Wildflower. Please refer to Sunset Western Gardens for plant descriptions and water requirements. Well this is certainly a different year from last. I like to refer back to the previous year’s monthly missive. Last year the tomatoes were suspect and the basil was rocking, Well the tables have turned, and the basil is crying, why I am not sure, most likely sourcing of the plants. I think I purchased mine at Anderson’s in La Costa and they were very root bound. I have also purchased two of the Trader Joe’s $2.99 basil bombs, one I planted on the deck in a five gallon of pure potting soil, one in the garden. I didn’t separate either. You may remember that a few months ago I referred to a load of mushroom compost that I picked up in San Marcos. The stuff was pretty hot with horse manure and a little salty looking; I put it in the bottom of the garden and sprayed with water to leach our some of the horse urine. I dug a good portion into two rows of my garden as a test. I will have to say that the green beans and tomatoes loved it. Please check out the accompanying pictures. I think I have the biggest bean plants (simple Kentucky Wonder) I have had on FM in 25 years and they are just getting ready to bust loose with a beanapalooza. It is going to pickling time on the ranch for the next two weeks. The tomatoes after a slow start are ripping it up; I am particularly pleased with Black from Tula, Green Zebra and Black Prince. I bought all of these at Grangetto’s in Fallbrook. The lettuce is a little lame, but I can still make a salad every other night and I am now starting a major push for fall planting. I will also be putting up beets this week and prepping beds for another crop. I just don’t feel right without at least 40 pints of pickled beets for the winter. My cukes are producing too although the ones I bought at Home Depot marked as Japanese, turned out to be regular old 9 inchers. Not complaining I get one a day for salads. 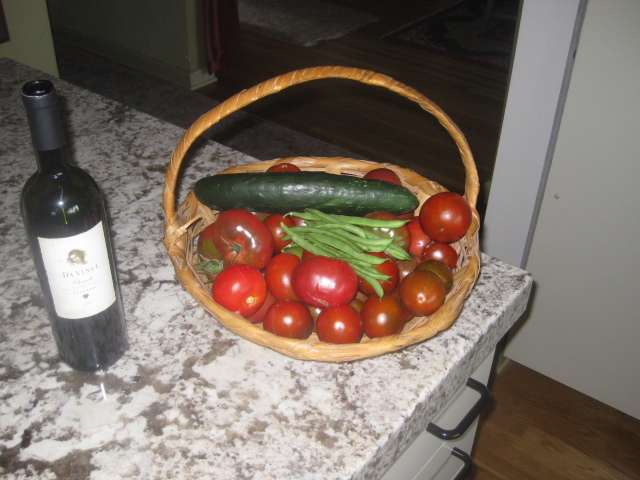 We had a nice summer meal of grilled salmon, chilled fresh cukes, green beans and tomatoes with Montrachet cheese. Pretty darn good to be here now. I would suggest a major move on green beans, they are a very rewarding crop and can be enjoyed fresh or pickled. Just look up a ‘dilly bean’ recipe on the Internet, easy to do and delicious. Make sure you have REALLY tall poles to support them. My plants are over 10 feet tall and I am going to have to use a ladder to harvest. One last thing, for the first time since I moved here in 1985 I put herbs in pots on the back deck (slow learner) off the kitchen. I have basil, thyme, dill (now needing replacement) two types of parsley and Mexican Oregano and chives. I built nice little redwood surround to disguise the black 5 gal pots and got plastic pot trays at Home Depot for $2/per. Very Happy with the result. So as is our custom, we refer once again to the 1994 “Reliable Seeds” catalogue from our inspiration Charles Ledgerwood, if this is your first visit to our site, please look back on the previous issues to find out more about Mr. Ledgerwood. BEANS, beets, carrots, CELERY, CORN, CUCUMBER, leek, LIMAS, okra, , NZ spinach, Swiss chard and marrow squashes. You can keep planting bunching onions and radishes of all sorts all summer long to spice up your salads. This is the time to start staging you garden and growing space to prepare for the September to December planting season, arguably the best time to grow things in SoCal. Look at you lawn and think how much water you put on it and think how much lettuce, arugula and spinach you might be able to grow if you just give up a small part of it. Start preparing extra space for fall crops and watch this blog for the fall planting tips. Centurea, Cineraria, Cosmos, Gypsophilia, Hollyhock, Pansy, Lunaria, Marigold, Nasturtium, Phlox, Salipiglossis, Snapdragon, Stock. Sweet Peas, Verbena, Viola and Zinnia. Please refer to the last several year’s August missive for some great suggestions.